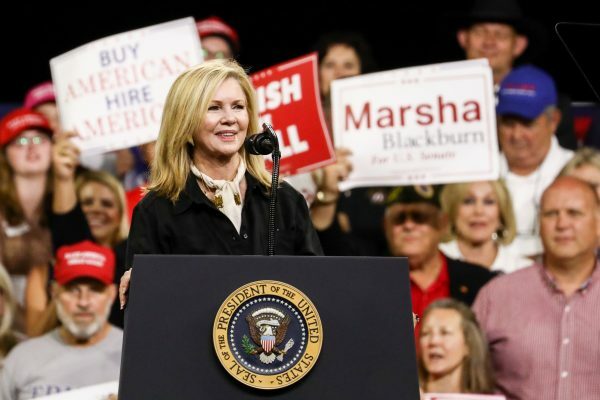 JOHNSON CITY, Tenn.—The nation’s eyes turned to Tennessee on Oct. 1 as President Donald Trump continued a string of pre-midterm rallies, this time advocating for Republican Rep. Marsha Blackburn who is aiming for a Senate seat. The rally at the Freedom Hall Civic Center amassed over 92,000 ticket requests, the highest number for a rally so far. It comes after the administration ordered the FBI to conduct a supplementary investigation into the sexual assault claims against Supreme Court nominee Judge Brett Kavanaugh. Earlier in the day, Trump lauded a new NAFTA replacement deal with Canada and Mexico, touting it as a win for all three countries. He previously called the NAFTA agreement one of the worst trade deals for the United States. Blackburn will face off against Democrat former Gov. Phil Bredesen in what is seen as a tight race. In 2016, Trump won the state by 26 percentage points, garnering 1,522,925 votes in total. “Phil was a major financial supporter of president Barack Obama and crooked Hillary Clinton. If Phil is elected Chuck Schumer will be majority leader,” Trump said. According to RealClearPolitics average of recent polls, Blackburn and Bredesen were tied at 46.6 percentage points. “They want to replace freedom with socialism. The Democrats want to turn America into Venezuela—we are not going to make it happen,” he told the crowd. Seconds later after eyeing the spot he added, “We only have friends in Tennessee,” to raucous cheers. The Tennessee rally marks the first of four such campaign events planned for this week. The president also endorsed a number of other Republican candidates running in The Volunteer State, including gubernatorial candidate Bill Lee and Rep. Phil Roe (R-Tenn.), who is running for re-election. Trump returned to the subject of Senate Minority Leader Chuck Schumer (D-N.Y.). “Phil is only running because Chuck Schumer begged him to run,” Trump said. “If you want to stop Chuck Schumer from becoming majority leader… then you must vote against Bredesen,” Trump said. “We cannot allow ourselves to be pushed around,” he added. Blackburn first began her elected service career in 1998 as a Tennessee State Senator before being boosted to the U.S. House of Representatives in 2002 to represent the state’s 7th Congressional District. According to her biography her career as a state senator was marked by her commitment to “fiscal common sense and government accountability.” Before joining politics, she was a small businesswoman. Her opponent, Phil Bredesen, is a former governor, mayor, and CEO. As governor he worked on land and water conservation initiatives and education reforms. Prior to public service, Bredesen worked in the healthcare industry, according to his biography. 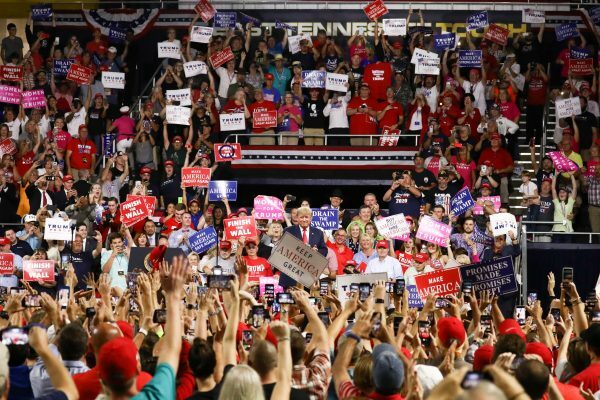 Trump said the upcoming general election is paramount for the country’s safety and its prosperity, as he repeatedly touted his impact on the economy and urged his supporters to vote. “We’ve created over 4 million new jobs and lifted almost 4 million Americans off of food stamps. We’ve added nearly over 600,000 new manufacturing jobs” Trump said. He also touted lowering health insurance premiums by 26 percent in Tennessee.